The Audio systems we listen to tend to have multiple combinations of speakers going from a single loudspeaker, to sophisticated multi-channel 3D surround systems. When creating a listening room, or adding a sound system into your living room for example, where you put the speakers is an important factor in the sound quality of the overall result. 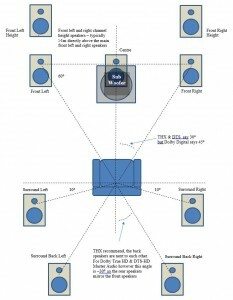 This guide helps to explain the speaker positioning options for the various speaker numbers and combinations. 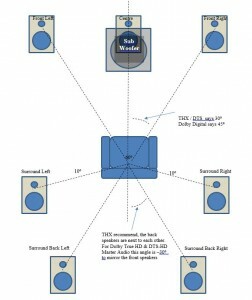 We have another guide which helps to explain the various surround sound formats. We are always happy to offer advice, and regularly assess room layouts and speaker positioning for our customers. Good old fashioned stereo – still the format most used for Radio and Music, after all we only have two ears! For a high quality system, the stereo speakers will tend to vanish with a full 3D soundstage presented in front of the listener. This works only when all of the components used are phase-linear, meaning that all of the frequencies arrive at your ear at the same time, and in phase with each other. Our ears are very sensitive to the phase of an audio signal, and the brain uses the phase and timing to determine where a sound is coming from. Adding a Sub to a stereo pair of speakers brings you to 2.1. This format has been largely dismissed by HiFi aficionados, as the timing (phase again) between the sub and stereo pair has to be accurate for it to sound good. This format should not be discounted, as it means that you can have a smaller pair of main speakers with a sub to fill in the lower octave or two in the audio spectrum. With some careful alignment, the results can be very pleasing. The Bass frequencies are much harder for the ear to detect where they are coming from, so it is less critical where the sub is placed, however if there is much of a distance difference between the main speakers and sub, it can sound disjointed, and disappointing overall. 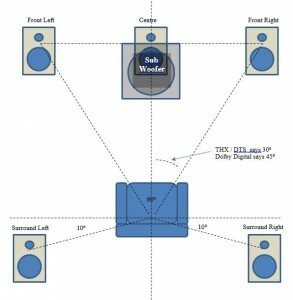 In addition to the physical layout of speakers, there are a number of surround sound formats, which we covered in a previous Blog article: Elephant Traps in Surround sound setup: Audio Modes. 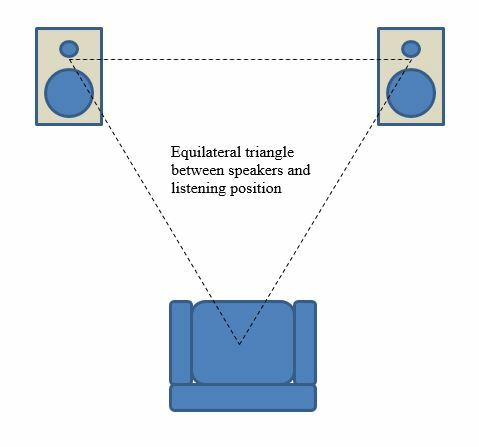 The reality of the variety of rooms that surround sound systems are installed in, means that the speakers are often asymmetrically placed, or either too close together or too far apart for the perfect scenario. In these instances, it’s always a compromise, and the timing adjustments in the AV amps have to be used to try and compensate. This is used in larger listening rooms, and for Dolby True-HD and DTS-HD Master Audio setups. Essentially it is similar to the 5.1 setup above, however with the addition of two rear channels. This provides better steering around the rear of the room, though can often be a little startling if there is a lot of rear channel information in the sound track. For a larger listening room where there are a number of rows of seats, duplicating the surround speakers at the sides to form a 7.1 system, means that at each sitting position the surround speakers are approximately correct, and is an earlier implementation of 7.1 channels. This is a different layout to the Dolby Atmos recommended 7.1 channel layout (see below). 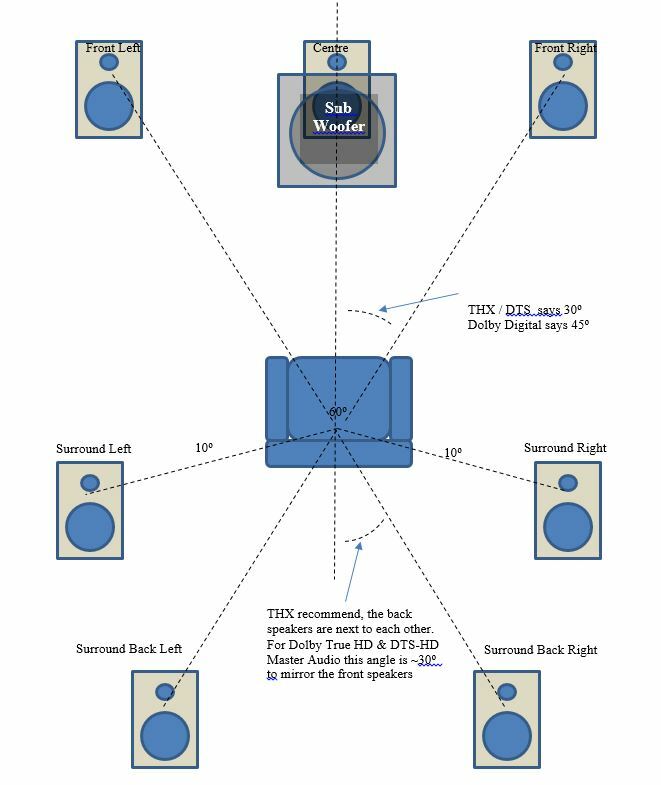 The generally accepted implementation of a 9.1 channel setup is by adding height channels to the front main speakers. The layout is similar to the 7.1 system as above, however directly above the front left and front right speakers are Front Left Height and Front Right Height speakers pointed at the listening position. These expand the soundstage at the front for systems where the phase information within the playback chain does not do this directly. Auro 3D was developed in a project at Galaxy Studios and spun off as Auro Technologies. This format supports a height layer of speakers ( in fact up to two height layers) to provide an immersive 3-D sound scape. The Auro 9.1 layout consists of the conventional 5.1 channel layout, with the addition of 4 height speakers above the front and surround left and right channels. 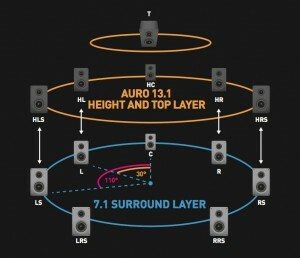 The Auro 3D 11.1 includes a centre height channel and a directly overhead “voice of God” speaker position. The audio track is designed to be able to be decoded as standard PCM audio, however processed into the 3-layer 3D experience in appropriate equipment. The idea with Auro-3D is that it is possible to record and playback in 3D for as accurate as possible an immersive experience. The next two formats are the latest in surround sound generation. They use modern processors and computer mixing of soundtracks to allow the director to take a specific sound as an entity, and apply this sound anywhere in space around the listener. 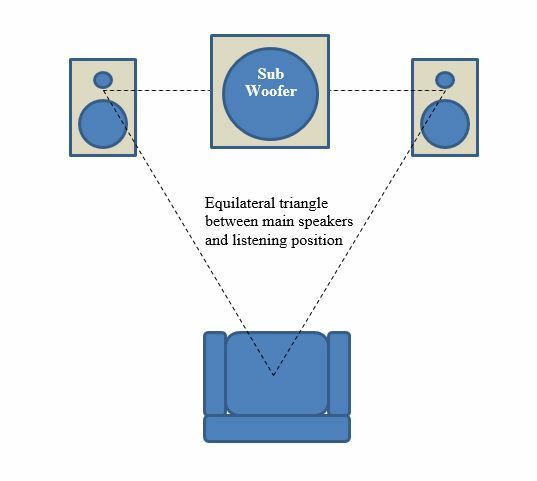 the processing algorithms adjust for phase, delay and volume from each speaker to make the object sound as though it is in a particular place relative to the listener. These formats can be very convincing, and the better matched the speakers, the better the effect. The ultimate though is to use large numbers of channels covering the entire listening hemisphere. Dolby Atmos was the first of the Object Oriented audio codecs. IT takes the traditional surround sound layout and adds a height element, either with ceiling speakers, or with upward firing speakers on top of the front left and right speakers. Dolby Atmos can cope with up to 128 independent Audio Objects, that go into the mix. The Basic Dolby Atmos layout is referred to as 5.1.2 which means the regular 5 channels (left, centre, right, surround left, surround right), plus the .1 for the sub. Then the .2 refers to the two height channels at the front. The next level of Dolby Atmos is 5.1.4 where the 5.1 is conventional enough, however there are now both front and rear channel height speakers. These can again be either upward firing speakers above the front and surround channels, or be two pairs of ceiling speakers above the listening position. Consumer grade Dolby Atmos layouts go up to 9.1.4 channels, however professional theatre installations can go up to 24.1.10 channels. 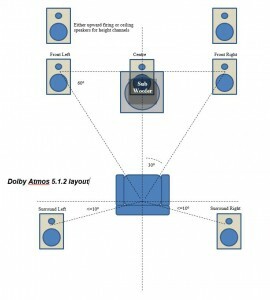 A Dolby Atmos Installation Guidelines document is available here from Dolby. DTS-X was introduced in January as DTS’ competitor to Dolby Atmos. They have taken a slightly different stance to Dolby, using standard surround sound configurations as their baseline, however still with the Object Oriented sounds. 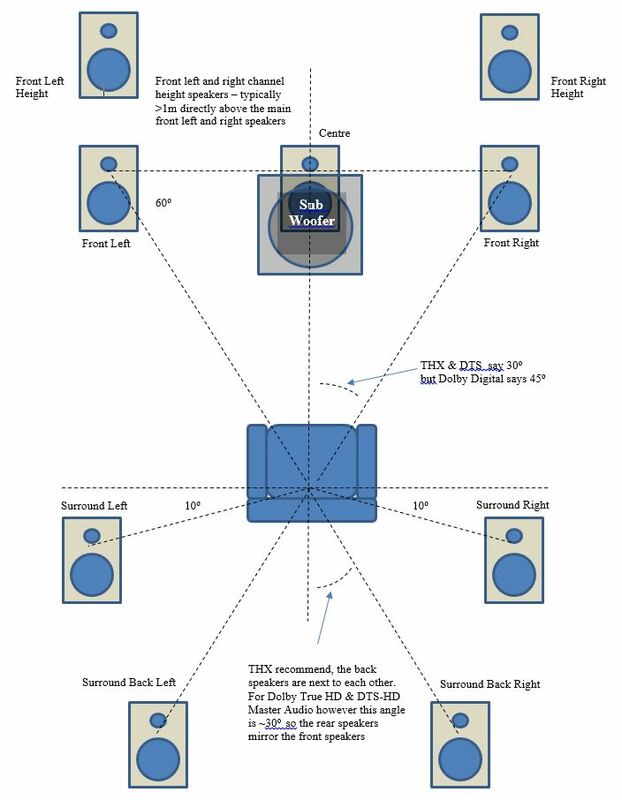 The Idea is to be backwardly compatible with existing speaker layouts, however with the ability for height layout extensions up to 11.2 channels (or in the parlance of Dolby Atmos above 5.2.5 channels) in 32 different positions. Like DTS-HD Master Audio, the DTS-X format supports up to 24 bit 192KHz audio for stereo and multi-channel mixes, and 24 bit 96KHz audio for object based audio. DTS have made the encoding standard open source, so is free for the studios to implement, and also being backwards compatible, they are clearly pushing for widespread implementation amongst the equipment manufacturers. In reality there are few home cinemas that are designed from first principles, and most are shoe-horned into existing rooms, which always leads to compromises. A standard shoe-box shaped room will encourage standing waves around the room, leading to bass nodes and first order reflections confusing the sound. Whilst some reverberation can be attractive ( think a concert a cathederal ), if you now include additional reverberation in your listening room, it just produces a confusing audio picture. We normally recommend as many soft furnishings as you want, as these all help to break up the reverberations. If you really want to make your room sound good, a full modelled Acoustic Room treatment is advised. This adds bass traps into the corners and a combination of diffusers and absorbers around the room to control the reflections, and ensure the room has a minimum impact on image you hear. In reality it is easy to have a large affect on improving the sound of the room. For the ideal home cinema room, if one was to start from a clean sheet, it would be an odd shape, with no parallel walls / floor/ celiing etc. This means that it is hard for standing waves to form around the room. Then appropriate absorber material on the walls and ceiling will dramatically reduce the first order reflections. We find that speakers outside the screen produce the best sound (as there is always some reflection and absorbtion in the screen material), however for very large screens (as in most cinemas), there may not be space around the screen for a speaker, in which case embedded speakers behind the main screen are the only solution. We are experienced in installing home cinema systems in a variety of differing situations and room layouts, and always try to get the best result from the space we have to work with. This may be a near perfect environment, or it may be full of compromises, but with the right equipment and an imaginative layout, excellent results are nearly always achieved.